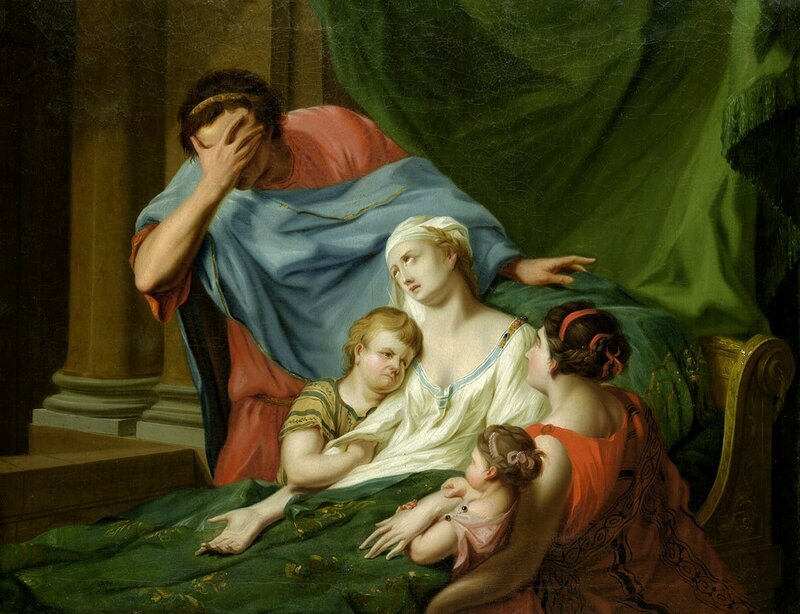 Alcestis was a queen in Greek mythology famed for the love of her husband, for Alcestis would forfeit her own life so that her husband Admetus might live. 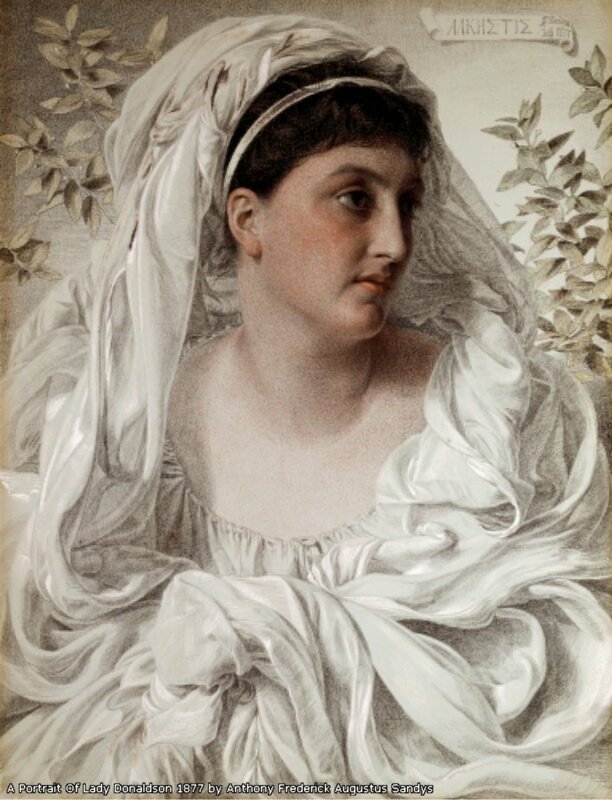 Alcestis' father was King Pelias of Iolcus, by either Anaxibia or Phylomache, making Alcestis a princess of Iolcus. Amongst the siblings of Alcestis therefore was Acastus and Asteropia. When of age King Pelias sought out a potential husband for his daughter, but Pelias made a stipulation that Alcestis would only wed the individual who could yoke a lion and a boar to a chariot. One potential suitor of Alcestis was her cousin Admetus, the son of Pheres, who had succeeded his father as king of Pherae, Thessaly. Admetus had an advantage over the other potential suitors, as for a year he had had the Greek god Apollo working for him tending to his livestock. This was one of the periods when Apollo was exiled from Mount Olympus for his misdemeanours, in this case Apollo had killed the Cyclopes after his son Asclepius had been killed. Admetus had been a kindly employer to Apollo, and so when the god learned that Admetus intended to wed Alcestis, Apollo himself put the lion and the boar in their harnesses, so that Admetus could show to Pelias his achievement. Having achieved the stipulation asked of him, Admetus was thus allowed to wed Alcestis. As well as being a good employer, Admetus would achieve his name in heroic circles for it was commonly said that Admetus was both an Argonaut and also a Calydonian Hunter. Now it is assumed that the marriage of Alcestis to Admetus took place before the quest of the Argonauts and the Hunt for the Calydonian Boar, for Pelias was killed shortly after the return of the Argo to Iolcus, and there was no time for Apollo to be in servitude to Admetus, nor for Pelias to arrange the marriage. 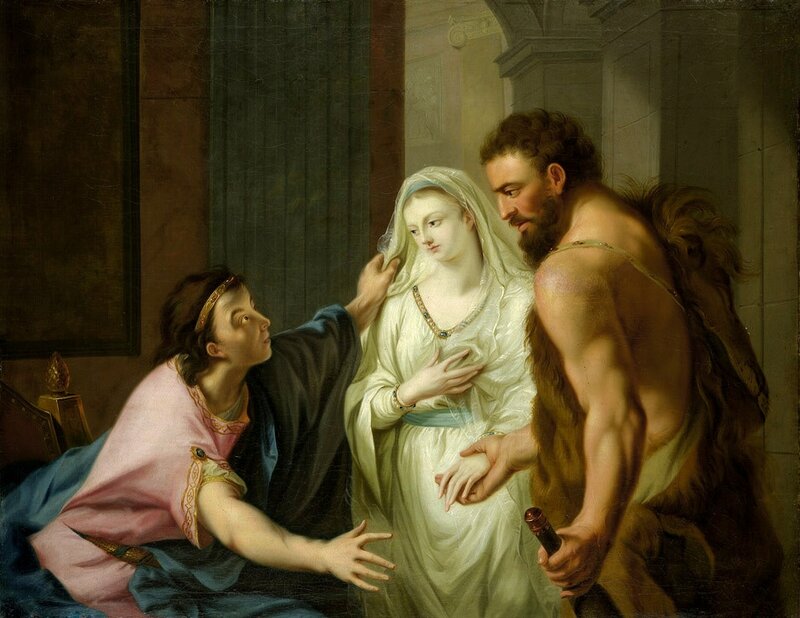 Pelias was of course murdered by his own daughters, when Medea tricked them into believe that they would be rejuvenating him; but, if the marriage occurred earlier then Alcestis would not have been one of the murdering daughters, for she would have been in Pherae. Having wed Alcestis, Admetus though neglected to offer up the appropriate sacrifices to the gods, and indeed the goddess Artemis was omitted from the sacrifices altogether, riling the Greek goddess. Thus it was on their wedding night, Alcestis and Admetus discovered a number of snakes in the bedroom. Apollo once again intervened, ensuring that Alcestis and Admetus came to no harm, and then telling the pair how to appease his sister. Apollo would also go further, and would also get the Moirai (the Fates) to extend Admetus’ lifespan beyond its life-thread; the Moirai though set a proviso that someone else would voluntarily have to die in his place. The time eventually came for Admetus to die, but no-one was willing to die in the king’s place, even though Admetus had expected one of his elderly parents to volunteer. Eventually, because of the love Alcestis held for her husband, Alcestis volunteered. Thus Alcestis died, and was placed in mausoleum, but now Admetus wished that he too was dead, for he had lost his soulmate. At this point the Greek hero Heracles arrived in Pherae, Admetus, as well as being a fellow Argonaut, had always offered Heracles a warm welcome to his house, and so Heracles decided to bring back Alcestis. So, Heracles entered the tomb of Alcestis, and there encountered Thanatos (Death) preparing to take Alcestis to the Underworld. Heracles would wrestle with Thanatos until the Greek god surrendered; Heracles had released Alcestis from Death. An alternate version of the death of Alcestis had Persephone returning the loving wife from the Underworld, to be reunited with her husband. In either case Alcestis was alive, and so husband and wife were reunited, and Alcestis and Admetus would spend many more happy years together. Alcestis would give birth to two children by Admetus, a son named Eumelus and a daughter called Perimele. Eumelus would achieve a heroic name for himself at Troy where he led 11 ships, for Eumelus was a Suitor of Helen; and at the end of the Trojan War, Eumelus was to be found in the belly of the Wooden Horse. Perimele would marry a hero, for she became wife of Argos, the Argonaut who crafted the Argo.